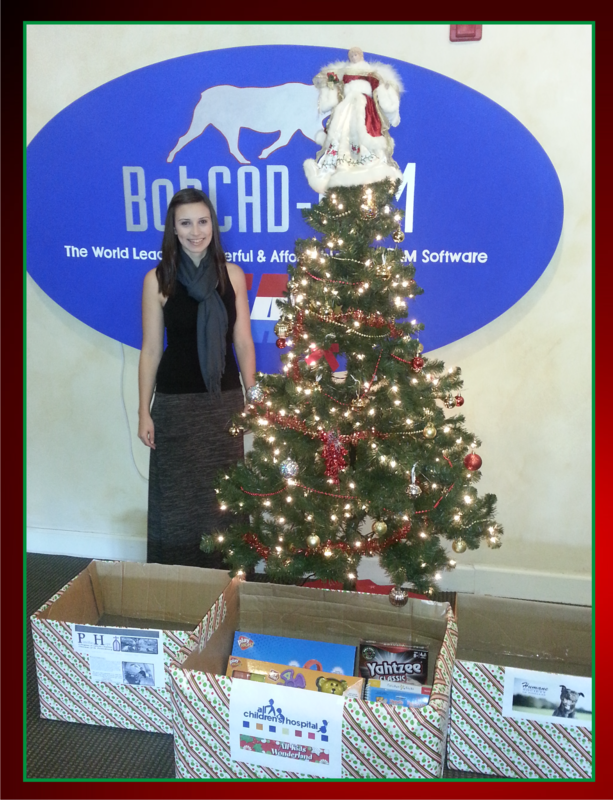 Clearwater, FL – BobCAD-CAM supports our team members in their quest to become involved in important community activities such as charities. This year Executive Assistant Melissa Hammen takes our Team Member Spotlight for her hard work in supporting 3 important charities throughout the holiday season. Her efforts are greatly appreciated by the community and by BobCAD-CAM. – All Children’s Hospital, located in St. Petersburg, which treats patients from birth to 21 years of age, 60% of which are age 3 and under. – The Humane Society of Pinellas County which is a no kill shelter located in Clearwater, Florida. – And Pinellas Hope, a facility located in Clearwater that provides emergency shelter for 250 men and women. All of these organizations deserve a little extra hope and kindness, especially this time of year. There are so many people that need help that it is hard to choose who to give aid to, which is why we select 3 organizations that vary to do the most good. These organizations also have a special meaning to me. I have been adopting shelter animals since I was 3 years old and my current 2 dogs were both adopted from the Humane Society. I have also volunteered at the Humane Society and I know first-hand how hard these people work to keep these animals safe and cared for and get them into a great forever home. When I was younger, I spent a lot of time in hospitals, and just the slightest bit of kindness will light up the faces of the kids that are going through so much. I discovered Pinellas Hope online and their mission spoke to me. The shelter was only supposed to be open for 5 months, but they stayed open because they saw how they could do more good. The facility is on 20 acres and is covered with tents that are used as emergency shelter. Pinellas Hope also offers adult education and job placement services. So, when a person comes in needing assistance, the facility gives them shelter, food, and helps them get back on their feet to re-enter society. I make these donation drives possible because I get inspired by how much others are doing to help those in need. I feel that compassion is contagious, and if my time and energy making this happen gets others to feel more compassion toward helping others, I have done a good job. Thank you Melissa Hammen for your support, dedication and hard work for these 3 important groups. BobCAD-CAM would also like to thank each of these organizations for everything they do to help our animals, individual members and families of our community during times of need. Have a safe and happy holiday season. If you would like to help Melissa support these organizations please feel free to contact us directly at 877-262-2231 or 727-442-3554.